This statistic shows the level of user attention paid to smartphone app permission requests. 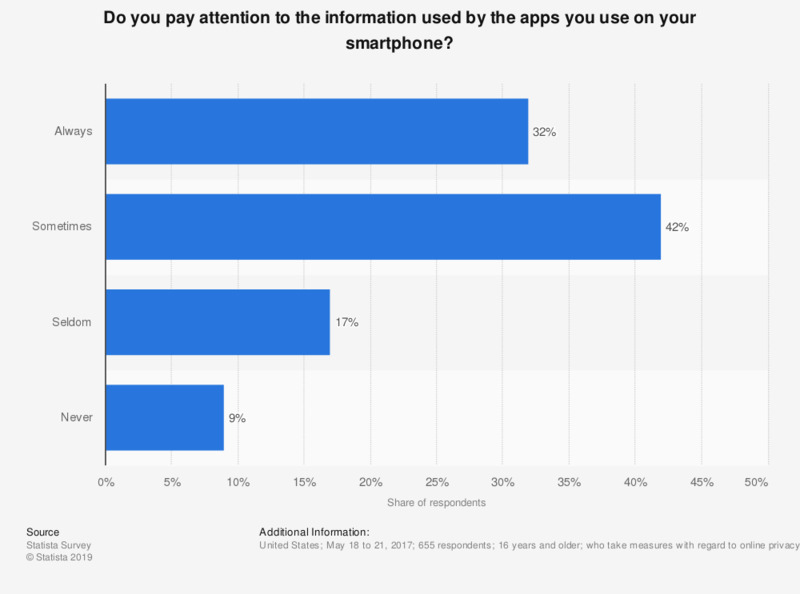 During the May 2017 survey, 32 percent of respondents who took online privacy measures stated that they always paid attention to the kind of information used by apps installed on their smartphones. Original question: Do you pay attention to the information used by the apps you use on your smartphone? How concerned are you about authorities and companies misusing your personal information? Percentage of new car buyers who (strongly) agree with the statement: "I am reluctant to use car-related connected services because I want to keep my privacy"
Do you agree or disagree with the statement: "The government asks you for more and more personal information"?